“You can’t see the forest for the trees.” This is one of the expressions that I think best sums up parenting. We spend years paying attention to the details of raising our kids. We focus on food and clothing and shelter at first. As they get older, we begin to address big things like manners and values but we do it in small ways and can’t always see if they’re learning what we want them to learn. We remind them to say “please” and “thank you." We ask them to share their toys with their friends, to include others and to please, please stop throwing sand. We remind them to do things for others without being asked — offer your sister a piece of your candy, take out the trash without being reminded, open a door when someone’s hands are full. We teach these lessons day in and day out and because we have to repeat ourselves so often, it’s easy to believe that they just aren’t getting it. Add to that the fact that our children push against the limits we set and the guidance we offer. Even though we know that they have to separate from us to figure out who they are and who they will be in the world, it can be hard. Once, in frustration, I said to my son, “Why can’t you just do what I tell you to do? It would save you so much trouble!” He said, “Mom, sometimes I have to learn from my own mistakes,” and he was right, of course. We can’t always see the people our children are becoming because we are immersed in the challenges of everyday life. But every once in a while, we are lucky enough to get glimpses. Recently, the kids’ grandmother called on Skype to talk to them about their upcoming visit. Next week, they’ll be flying to Pittsburgh by themselves to spend the weekend with their grandparents. I was not part of the conversation but could hear both sides. Their grandmother asked about things they’d like to do and made suggestions and asked for their input. She talked about foods they like and discussed sleeping arrangements. My kids said things like “We’ll do whatever is easiest for you” and “I love that idea” and “Thank you for having us.” They were polite and thoughtful and expressed gratitude for her effort in making their visit special. In that moment, I could see them as complex people rather than simply my kids. We can’t always see the forest for the trees but when we do, it is often a beautiful gift. Vikki Reich writes about life and parenthood at her blog Up Popped A Fox and publishes VillageQ, a site for LGBTQ parents. Her writing has appeared online at Huffington Post, Brain, Child Magazine and Autostraddle. She is a contributor to "Listen To Your Mother: What She Said Then, What We’re Saying Now" (Putnam Books, 2015). She lives with her partner and two kids in Powderhorn Park. 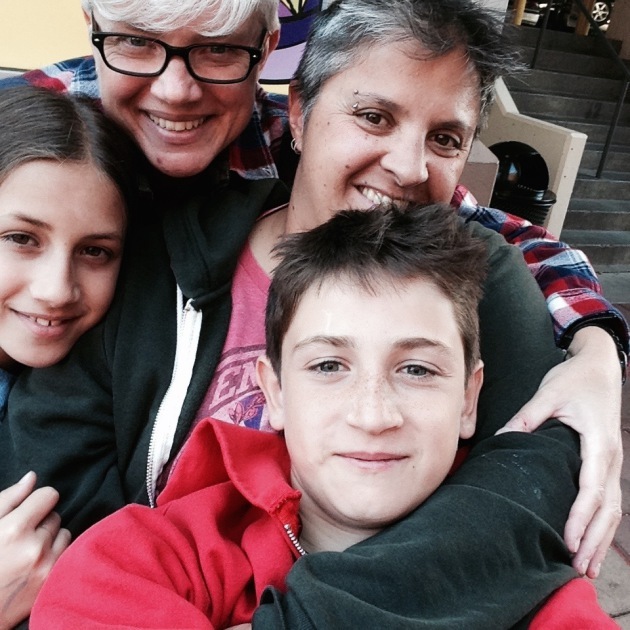 As much progress as we have made in our fight for equality, we still sometimes feel the pressure to be the perfect lesbian family. Making time for our relationship makes us better partners to each other and when we are better partners, we are better parents. Our kids have had moments of unbelievable tenderness but have also had some epic fights. In sibling relationships, there are no guarantees. We can't always see the people our children are becoming because we are immersed in the challenges of everyday life but every once in a while, we are lucky enough to get glimpses. Halloween is the quintessential childhood experience. But as the kids get older, I know our days of costumes and Jack-o-Lanterns are numbered.